At BUNDA we are here to make opals cool again. We have a deep experience working with this unique and precious gemstone that spans over two generations. This knowledge, coupled with the vision and the skill to create jewellery pieces which are like sculptures, enables BUNDA opal jewels to display the mesmerizing beauty and sheen of this magnificent gem to maximum effect. Australia is the number one world source for precious opal due to unique conditions that occurred during the Cretaceous geological age between 66 and 144 million years ago. Most of our opal deposits are part of rock formations that form our famous 'Great Artesian Basin', which runs as a 'U' shape from the Gulf of Carpenteria down to Northern NSW. Australian precious opal has the reputation of being the finest quality in the world. In 1993, Governor General, Sir Bill Hayden, declared opal as Australia's national gemstone - our nation and opal are inextricably linked. Opal is essentially a form of hydrated silica, which means it contains water in its structure. Water content varies in precious opal from 3-10% and from 1-21% in other types of opal. In 1964, some clever researchers at the CSIRO in Melbourne revealed the micro structure of opal with the use of an electron microscope which was cutting edge technology at the time. They discovered that opal is made up of an orderly three dimensional lattice of minute silica spheres in optical contact. It's the arrangement of these spheres that produce the fascinating play of colour which opal is famous for. The type of opal used in fine jewellery is known as precious opal. 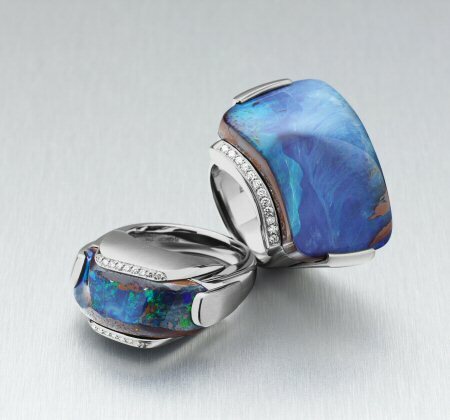 The characteristic that separates precious opal from common opal is its unique sheen known as play-of-colour. This phenomenon happens when incident white light hits the opal's tightly packed silica spheres and the light is both reflected and diffracted, as well as being split into its spectral colours. The colours produced are contingent on the size of the spheres, with the smaller spheres producing blue and the larger spheres producing reds and oranges. When one views a piece of precious opal from different angles the rainbow colours alternatively flash in a very playful manner. Precious Black Opal - Precious black opal is solid opal which shows a play-of-colour on a black background or body tone when viewed face up. 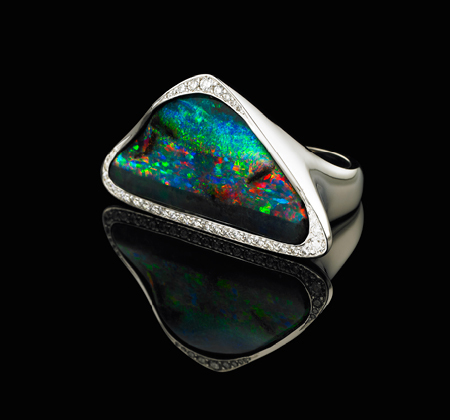 The best known source of black opal is Lightning Ridge in New South Wales. Precious White Opal - Precious white opal is solid opal which displays play-of-colour on a pale background or body tone when viewed face up. The most famous source of white opal is Coober Pedy in South Australia. Boulder Opal - Boulder opal hails from Queensland and is a combination of opal and rock, normally ironstone or sanstone. The precious opal with play-of-colour runs as either seams through the ironstone or there is an undulating contact between the opal and rock. It is considered to be a solid piece and not a composite stone.